It is literally Bubble Mania with the Bubble Whale. 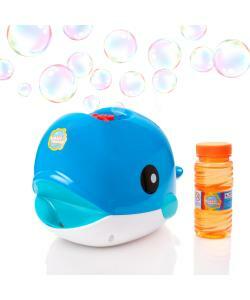 Unlike most bubble machines, the Bubble Whale squirts bubbles upwards, just like a real whale! Automatic battery operated bubble machine - Includes FREE jumbo 8 fl oz bubble solution tub. Very easy to use; simply add bubble solution and press the push button on the side. The air will be filled with hundreds of bubbles in seconds. With it's fun Whale design and bright colours, the Bubble Whale is fun to use, as well as strong, sturdy and built to last. The extra large bubble reservoir on the Bubble Whale means less time filling it up, and more time catching bubbles! 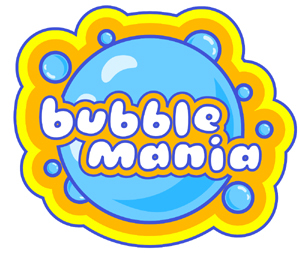 The Bubble Whale by Bubble Mania is one of the best performing battery operated bubble making machines on the market. It's high performance motor creates hundreds of bubbles that fill the air around it. The Bubble Whale is very simple to use; simply pour solution into the large bubble reservoir and press the large button that is handily positioned on the side of the machine. Children love nothing more than playing with bubbles and the Bubble Jet will not dissapoint. Includes an 8 fl oz tub of bubble solution so you can get making bubbles straight away. Bubble Jet size: Height 18cm x Width 19cm x Depth 18cm. Requires 4 x AA batteries (not included).